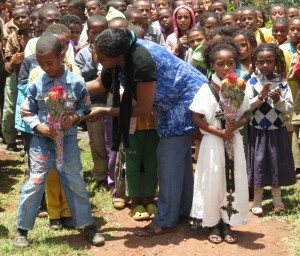 Shy little boy offers flowers at welcoming ceremony, Chancho, Ethiopia (Apr 2012). For every ending there is a new beginning. And Canadian Thanksgiving is such a great time to remember that. I’ve been moving house recently – going from a rambling heritage home in Eastern Ontario to a small city studio in downtown Toronto. This transition has had me thinking – on more occasions than I would like to admit – about all of the ‘stuff’ we can have and about what is the ‘stuff’ we really need. As we head into Thanksgiving and towards thoughts of food and fellowship, gratitude and generosity, I am reminded about what a small role my ‘stuff’ plays in bringing the spirit of Thanksgiving to life. My experience at Canadian Feed The Children visiting children and communities in Uganda and Ethiopia, in Haiti and in Canadian First Nations communities, is that living in poverty – which could be defined in part by the lack of ‘stuff’ – does not preclude anyone from showing the most tremendous hospitality and generosity. Whether it’s a roadside bouquet of flowers given by a child, the sharing of personal stories with women over a beautiful coffee ceremony, or listening to community leaders speak to their passion to create lasting social change for their community, I have never failed to be deeply moved by the graciousness of the people I have had the great privilege to meet and how little ‘stuff’ played a role. 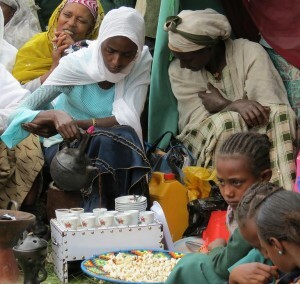 Ethiopian coffee ceremony – learning about these women’s lives over a cup of rich, syrupy Ethiopian java was one of the highlights of my trip in April. It is with this simple appreciation for what really matters that CFTC is celebrating World Food Day on October 16th , blending food and fellowship, gratitude and generosity with a community fundraising idea so simple, and so seasonally-perfect, that just about everyone can take part. No ‘stuff’ required! My sincere hope is that that as we celebrate Canadian Thanksgiving and all that we have, we are also open to a dialogue about food around the world – customs, traditions, dishes and values, poverty and wealth – that raises both consciousness and funds at the same time. You can find out more at www.WorldFoodParty.ca. Hosting a World Food Party can involve a menu of your own or simply selecting from the World Food Party menus we’ve developed to represent the dishes and agricultural products most important in the countries where we work. Most are one-pot dishes that can be easily prepared with humble ingredients available in Canada. It’s easy and fun, and best of all, you can turn it into an opportunity to raise funds to support life-changing nutrition, education and food security initiatives for thousands of children and families in Canada and around the world. With the abundance of the Canadian harvest all around us, let’s stop and give thanks for all that we have beyond our ‘stuff’. And whether you’re in a tiny studio or a sprawling country home, I hope you will join me to celebrate and honour World Food Day sometime this month. Happy Thanksgiving to everyone ~ and Happy World Food Day to all!